Built from Ink and Tea: A Review of The Lego Adventure Book, Vol 1! Some time ago, an author from No Starch Press emailed me about being featured in a book that he was writing. The topic was a feature on adult fans of Lego (or AFoLs, as they are called). More than happy to contribute to a book about Lego, I sent him the requested information and thought nothing more of it. Fast forward several years. Last autumn, I finally saw the result of the author's labor, come to life in a book, called The Cult of Lego. This was definitely an awesome, coffee table-style book, all fancy in hardback, big pictures, and a plethora of information. Then, a month ago, No Starch Press (the publishers of The Cult of Lego) contacted me again, asking if I would be interested in seeing and reviewing several of their latest offerings to the Lego community. One of these books, The Lego Adventure Book, Vol. 1, was what I chose to present to you today. The Lego Adventure Book, Vol. 1: Cars, Castles, Dinosaurs, & More! is the title of this lovely, large-size, hardback book, and this book is AWESOME. Okay, now that I have that very important bit out of the way, let me tell you more. Written by Megan Rothrock (truly an AFoL), The Lego Adventure Book, Vol. 1, takes the reader on a clever, Lego-illustrated journey through a myriad of Lego creations. 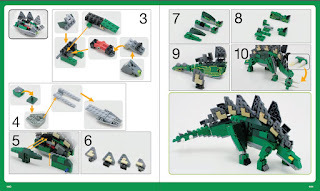 The format is comic-like, slightly reminiscent of scenes from the Lego Magazine, where still images are brought to life with the addition of speech bubbles and simple storyline. On that topic, the photography in this book is wonderful. The pictures are clear, crisp, and well-taken - definitely a plus for a book about Lego, where readers may want to see details or attempt to emulate the models. The story begins with the author's Lego character (sometimes called a "signature figure" or "sigfig") telling the reader about a concept for an "Idea Lab." The reader is then drawn into the story, as instructions are given for the creation of the author's headquarters for building-adventures. These initial instructions definitely drew me to the book. Below the surface, what was presented was more than the "Idea Lab." It was a very versatile building with unique features in its construction, which could open the door to a whole world of possibilities - just from this first section of the book! Truly, it could be used for a nearly-infinite number of creations. Instructions for a simple, yet completely customizable, vehicle follow those for the "Idea Lab." By this time, I am not yet a quarter of the way into the book, but I am inspired to build with Lego, even as I read! (I restrain myself, for the sake of this review.) The instructions themselves are clear and easy to understand. Most of the time, they begin by showing pictures of all the necessary parts, separated by color (though the book emphasizes substituting your own color choices, if you lack a certain colored part or want a different design). Each step visually highlights the addition of pieces, in order to make the steps easy to follow. The addition of special building tips helps to clarify or present valuable shortcuts for the instructions. As the book progresses, the author highlights a number of Lego builders, presenting it as an adventure story to introduce these Lego enthusiasts and their creations. Each of them is presented with a specific genre in which they specialize, along with many pictures of their work and at least one set of instructions. The genres, through which the author takes an adventure, include Lego town, hot rods, miners, planes, science fiction (from buildings to starfighters to mecha), medieval buildings, dinosaurs, Lego dolls, the ever-iconic trains, and steampunk. In all of my experience with Lego, the Lego dolls were the one genre in which I was not really interested. However, this section actually impressed me the most, as it included instructions on how to build floor mosaics for Lego buildings, which could be used in any creation, as rugs, tiled floors, or courtyard patterns. The Lego Adventure Book, Vol. 1 concludes with a special look at some creations by Daniel August Krentz, a retired Lego designer and the creator of some of the most iconic Lego sets ever produced. This was truly a special treat and made for a fitting ending to the book. While I do wish the author had ended with her own implementation of some of the ideas, this book remains an amazing piece of work. For all fans of Lego, I cannot recommend this book enough. The photographs and instructions are certain to spark the imagination and flood the mind with ideas for the next Lego building project! The Lego Adventure Book, Vol. 1 is available from No Starch Press and Amazon. All images used with permission from No Starch Press.